In this 25 minute radio interview, the legendary Liv Ullmann discusses her relationship with Ingmar Bergman, the distinction between storytelling and lies, Kierkegaard, and why she loves The Guernsey Literary and Potato Peel Pie Society. Liv Ullmann is the subject of Liv and Ingmar, which is now playing the New York Film Festival. She has also appeared in many legendary movies. Condition of Mr. Segundo: Wondering whether his persona is predicated upon cries and whispers. Subjects Discussed: Maintaining patience while living with an eccentric genius, living in other people’s dreams, how women’s expectations have changed over the last fifty years, the spate of op-ed pieces about film culture being dead, the distinctions between storytelling and lies, The Guernsey Literary and Potato Peel Pie Society, pride in belonging to the storytellers, Scenes from a Marriage, telling your story in a documentary vs. drawing upon deep emotions as an actor, pretense vs. reality, what it really means to be a filmmaker, finding meaning in people who are difficult, getting negativity out through performance, not giving up, old people who grow bitter (and avoiding this), when the life in people’s eyes fades around forty, staying alive, Søren Kierkegaard’s idea of coming to the world with sealed orders, when shaking hands can be the most important gesture in your life, why Ingmar Bergman got such emotional performances from Liv Ullmann, Bergman’s bitterness over Liv not participating in Fanny and Alexander, Bergman’s efforts to restrict cast members from partying, efforts to control other people, what Liv and Ingmar did to relax, being an introvert, Changing, keeping the quest alive for the “lost kingdom of childhood,” and being disturbed by people who lie. Correspondent: Tolstoy once suggested that time and patience were the greatest of all warriors. And in watching this film [Liv and Ingmar], the great astonishment I had was how you maintained such grace and such patience with Ingmar throughout this entire run. I mean, here was a guy who locked the doors, who locked you and other cast members up, who built the wall around his house, who did all sorts of things. Didn’t let you see family and friends. Basically boarded you up. And I have to ask just from a basic standpoint, how do you maintain such patience with a figure like that? Is his genius enough to forgive his eccentricities? Were you just in a state where at that young age you were in awe of this man who was so intense and romantic? Just to start off here. I was really curious. I mean, that takes a lot of fortitude. Ullmann: Well, you know, when you describe it, it sounds more dramatic than it really was. Because he built this house for us. And I think he had a dream that we would be there, painfully connected and really by ourselves. And that is a dream you can have when you are middle-aged, which he was. Because the world had been tiring for him. And I was so much in love that I didn’t question it. And it’s many, many, many years ago when women more easily took to that role. And I don’t think I questioned it so much as I sometimes felt, “I don’t think I could consider living like this for always.” Because I longed for things which were outside of this island. And it’s more when I look back at it, I think, “So that was the Liv I was then. And the Liv that I’m now wouldn’t let that happen.” But mostly it was an incredible time. It was five years of my life living on that island that I would never, never be without. 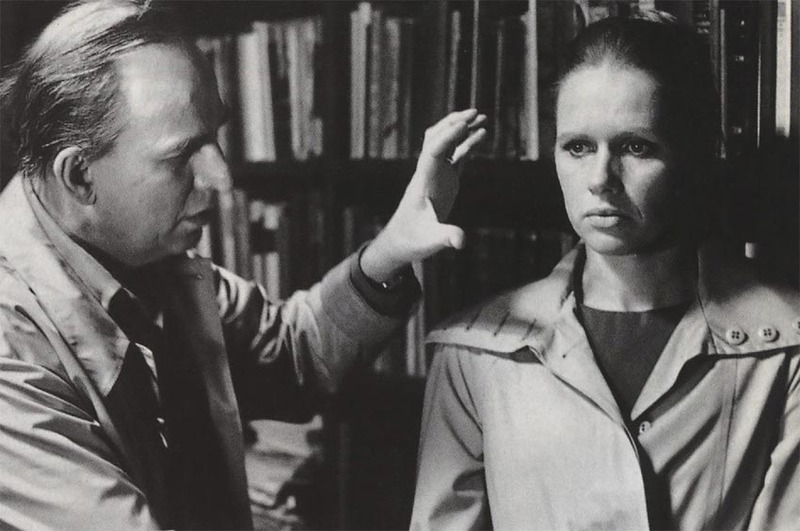 Ullmann: And why I corrected you on that is — one thing is to be trapped. Because that can hurt if you have your tale in there. Correspondent: Sorry for the paraphrase. Ullmann: But to live in someone else’s dream, that can be beautiful. And for long time, a dream can seem beautiful. But it’s not your dream. And if you are to live, you have to be in your own reality and/or in your own dream. Correspondent: But surely even before all this, you had your own dreams. You had perhaps some kind of autonomy that was in bloom. When did you know that you had this independent imagination? Ullmann: Well, maybe my dream was to live in someone else’s dream. For many women, that is a dream. At that time. Ullmann: Absolutely. But even today, I know women still are dreaming about man coming riding on the white horse. But we are talking now about fifty years ago. Or forty-five years ago. Women at that time, we had different expectations — or we thought we had — than women today. And sometimes I feel that women at that time maybe had a more realistic look at life than women today. I’m very happy. Correspondent: More realistic? How so? Ullmann: I think we said yes to moral life. We weren’t into Facebook and Twitters and computers. We didn’t look down at our hand all the time. We looked more at other people’s faces and things that were happening around us. Correspondent: That actually leads me to ask you. If you have an age defined by smartphones and social media, the very intimate cinema that you made with Ingmar and that you have made on your own — I mean, what chance is there today for that to grow? To have an audience? There’s been a lot of op-ed columns in light of the New York Film Festival, in which people are arguing “Well, why aren’t there more films for adults?” or “Is film culture dead?” What are your thoughts on this? I mean, is it still very much alive? Or is this becoming a more exclusive audience? And what do you do as a filmmaker and as an actor to counter the limiting short attention spans? Ullmann: I hope it is not dead. Because still, to sit in a dark movie house is one of the few places now that people can be and share laughter and dreams and incredible talent. Like you go and watch a ballet or opera or concert. But it’s less and less of that. Which is very sad. And we are more looking at TV and looking at lies from politicians and so. Or the computers and so. Life is more and more distorted from really who we are as human beings. And we’re living in a world of violence, of strong violence and terror. And so we really need culture. And we really need the art, the creation of people’s thoughts and who they are to remind us about who we are and why we are. And it’s harder and harder to find that out with the help of other people. And if we do it alone right now, we do it through machines, not through other people. Correspondent: What’s the name of the book? Correspondent: No worries if you cant. Ullmann: It’s on my bed. Ullmann: And I cannot wait til this afternoon when it is over and I will go back to that. Because it’s a lie. Because it’s a novel. But I’m getting so many thoughts about the time there was and time that is coming. And it has this strange title of….The [Guernsey] Literary and Potato Peel Pie Society. Correspondent: Oh yeah, yeah! I’ve heard about this. I haven’t read it. Ullmann: This is the truth. Correspondent: If you are lying and you say that it’s the truth, it’s worse than if you’re lying, but it’s a story. So you accept it. It’s about believing. Ullmann: And you don’t say it’s a lie! Ullmann: You say it’s a story. And I belong to the storytellers. And I’m proud to belong to the storytellers. And I feel we are losing them. Because it’s looked upon as some luxury and people want them to be quick and different and cartoonish. We’ll be lost world when it comes to who we are with our soul. What the soul is all about. Correspondent: So you see some of the more cartoonish advancements in cinema, some of the more stylistic advancements, as very harmful for it? Is that what you would say? Ullmann: I think, well, so many of it is harmful. And we have seen it. Because it doesn’t aspire to peace and connection and humanity. Ullmann: It aspires to violence and to how many people can I kill within a minute. And it looks brave and strangely adventurous. Correspondent: Yeah. I have to ask. I mean, you have put yourself emotionally on the line as an actor for all of these films. What’s it like to bare your soul for a documentary like this? Speaking of the difference between reality vs. narrative. And it’s also interesting. Because you’ve also been fortunate. In, for example, movies like Scenes from a Marriage, there is a middle ground where it actually takes on a documentary-like feel for a chunk of it. So what’s the difference as an actor? And how does this make you feel to tell your story on camera? Is that harder than inhabiting a character? What are the emotional differences here? Ullmann: I don’t find it hard to talk about feelings and what I care about in life. And when I did this movie, I said yes only to do two days of interviews. And I don’t find that hard. It’s easier for me to be truthful than to make myself interesting. And it’s not hard at all. I find to pretend is harder. To lie is harder. Because then I’ll forget what I said in the other minute. I like to be truthful. I like to meet people who are truthful. I like when we connect that way, also because that’s the way where I find myself. I’m not different from other people. Other people have the same feelings that I have. And I think we miss that. That we are true to each other. Correspondent: So when you pretend, it’s not rooted in anything solid for you. It’s not a memory that lasts more than, say, remembering what it was like to walk around with Ingmar and talk with each other. That that’s more of a meaningful memory and therefore that’s easier. Whereas if you’re tapping into the deep visceral guts of something, that’s something that you inhabit but that you don’t remember because that’s just the way it works for you? I’m just curious about this distinction. Ullmann: Well, there’s a lot of things that I don’t remember. Oh maybe it was like this? And I will tell it. And that’s more storytelling. But there’s nothing wrong with that. But when I see, for example, this movie, there are things that had to do with me that I had forgotten and suddenly I see it. And I know that is the truth. And even stories that I have told about us. When I see it in a movie, a film that has been taken from other movies, I’ll say, “Oh, the reality was different.” And I welcome that. I think that is great. That my memories have now given color to things But when I see the real truth, I found it much more interesting. And for me to see this movie and to see certain things in this movie that I had forgotten, I like it. And thus the movie is a kind of gift to me.